A long player both in terms of time and essence, Marco Bernardi’s new release on Brokntoys is a cause for celebration. When thinking of his output in this decade, the artist seems to be in a continuous process of reinvention, in a natural and credible way lending distinct sound to almost every record he does. It creates an impression that – despite of residing in musically booming Bristol – Bernardi may well operate from an isolated place by not following the dominating trends in electronic music. 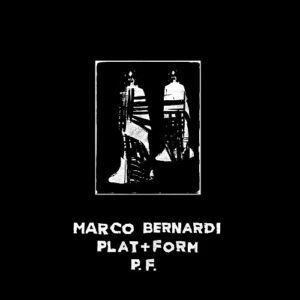 In his previous EPs for Brokntoys, Bernardi explored electro’s different facets, the 2015 EP conveying a dark and distorted atmosphere (e.g. the track “Sisterwatch”). Now floor oriented “Plat + Form P​.​F.” is a seriously versatile affair without any weak links. Subtle voice modulations recalling “Losing Control” explain the content of Atari-infected hardware buzz “Super Deep Voices”, while the title cut “Plat+Form P.F.” makes an U-turn to the deep and glitch house lane. Relying on similar basics, gentle and minimalist drum patterns in “Keep On Looking” would make to believe it’s a guest appearance by Terrence Dixon. Grim electro “Miscopol” opens the B-side with rusty beats and inhuman voices intercepted through stratospheric filters, in a deliberately cacophonic arrangement on the verge of total psychosis. A 3D makeover of acid house, “Voltsin” goes to a helium-powered conquest of high altitudes, before groovy bass and 303’s convulsions are mingling in “Soijien”. Expect funk, suspense and elan from this opus, when ‘quality time spent’ is the verdict six tracks and 35 minutes later. Definitely one this year’s stunning releases.